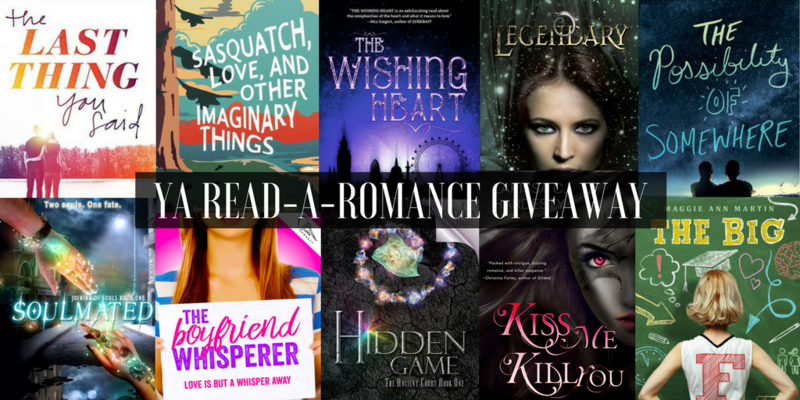 August is Read-a-Romance Month, and to celebrate, 10 YA romance authors have gotten together to sponsor a fantastic giveaway! The Grand Prize winner will receive 10 physical copies of the titles you see in the graphic, and a Runner Up will win the e-book of each title. International contestants are eligible from any country where Book Depository ships for free. Are you a romance blogger? We’re doing something extra special for you! You’ll get extra entries in the Rafflecopter as a thank you for your tireless effort and dedication in reviewing our books, to helping promote our work and the romance genre in general, and for being such supportive cheerleaders! Enter the Rafflecopter below for your chance to win! And don’t forget to check out the other nine sponsoring authors’ websites! To enter to win, simply fill out this Rafflecopter giveaway! Contest ends 8/31/17 at 11:59pm Eastern time. No purchase necessary. Void where prohibited by law. You must be at least 18 years old to enter or have your parent’s permission. The winner will be chosen by Rafflecopter and notified by email within 48 after the end of the giveaway. You will have 48 hours to respond, or a new winner will be chosen. All decisions are final. Odds of winning will vary based on the number of eligible entries received. If a mailed prize is returned for whatever reason, another winner will be chosen. None of the sponsoring authors are responsible for any lost, stolen, or misdirected prizes. Each sponsoring author is solely responsible for providing their book to you directly. This giveaway is not affiliated with any social media accounts associated with any of the sponsoring authors.